Christmas and the holidays are quickly approaching... so it's time to start checking some people off your gift list and what could be better than a holiday DVD! If you have a special child in your life between the ages of 2 and 6 years old that loves trains? 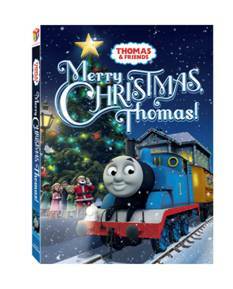 This Merry Christmas, Thomas DVD would make the perfect holiday gift! CHOO CHOO! All aboard for a fun and magical trip with Thomas and all his friends! Come ho-ho-home to the Island of Sodor and join Thomas and his engine friends for the holidays in Thomas & Friends: Merry Christmas, Thomas!